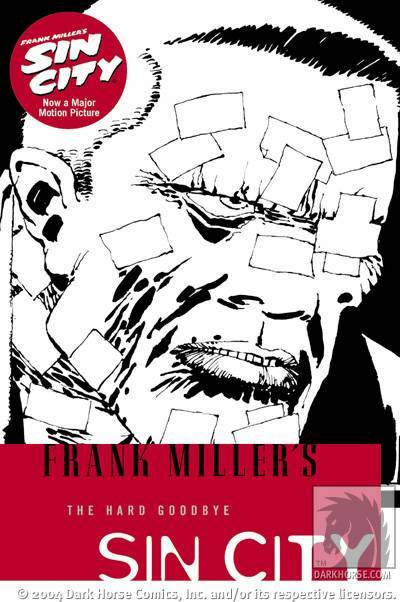 A co-worker lent me his copy of The Hard Goodbye, by Frank Miller. This graphic novel is one of the books that formed the basis of the recent movie Sin City. The Hard Goodbye follows Marv (the Mickey Rourke character) through his storyline to find the killer of Goldie, the prostitute who was "kind" to him. I thought the movie was decent, but visually stunning. I loved the daring of the director in putting this on screen and the sheer creativity to bring the visuals to life. It is such a dark, stylish, old fashioned pulp hard boiled novel of a film told with three different storylines. Reading the book I found it amazing how faithful the movie was. Very, very faithful. Much of the film's dialogue was lifted directly from the page and even more surprising, so was many of the images. Directly. This is the first volume of seven and what I thought was lacking on screen comes off far better on the page. I can see why Robert Rodriguez wanted to make a movie of Sin City and why the actors would be a part of it.